The Irish shamrock plant: all myth and marketing? The shamrock plant is recognised the world over as the badge of Ireland. It is probably most frequently aimed at tourists  it is the logo of the Irish Tourist Board, Failte Ireland  but its appearance is not restricted to helping visitors part with their money. You can find the emblem on everything from the tail fin of the airline Aer Lingus to the lampposts of Dublin. Most visitors, and even many locals, believe the humble weed is the official symbol of Ireland but that lofty status is held by the 12-stringed harp. Even so, the symbol of the three-leaf clover does receive some legal protection. Under the Trade Marks Act 1996, the use of the emblem is restricted to goods or services of Irish origin and only the Minister of Trade, Enterprise and Initiative can approve applications to use it. The real, living shamrock plant is traditionally worn on the lapel on St Patrick's Day. I can remember my grandparents excitedly attaching bushy sprigs to their clothing in the morning. They wore the plant with pride and I spent my early years wondering why they were so happy to wear something that looked increasingly limp and sad as the day wore on. Back then, my ignorance extended to the custom of Drowning the Shamrock. This is the practice of dunking the plant into the last drink of the night, and throwing the leaves over the left shoulder before knocking back the dregs of 'Patrick's Pot'. These customs are dying out in Ireland. Strangely, and perhaps sadly, it is only as an emblem that the shamrock thrives in its home nation; the tradition of wearing a sprig of the lush green plant St Patrick's Day is fading fast in Ireland. Even the invention of a little lapel sachet  a clever device that keeps the shamrock plant fresh until the last of St Patrick's Pot is drunk  has not revived this tradition in Ireland. It has, however, bolstered exports of shamrock all around the world. It was the Celtic druids who started the shamrock on its path to Irish glory! They believed the no. 3 to be a perfect number and, as such, to have inherent mystical powers. No one is quite sure why they believed this but it is possible the number signified totality ie past, present and future, or sky, earth and underground. Whatever the reason, the Celts attached great significance to the number and this is clearly expressed in their artistic symbolism. Three headed faces appear in art relics, as do triskeles (three connected spirals) and triskelions (three legged symbols such as that adopted by the once-Celtic Isle of Man). In addition, Celtic society was organised around the sacred three, with three classes, three colours, and three principal gods. In this atmosphere, it is no wonder the humble shamrock plant, with its three leaves, was reverred. St Patrick, when he set out to convert the Celtic inhabitants of Ireland, would have been fully aware of their predilection for the number three and, according to legend, he used the plant to illustrate the Christian concept of the Trinity ie to show how one God divided into three: God the Father, God the Son, and God the Holy Spirit. It is worth mentioning that this story of how the 5th century saint explained the Trinity did not appear in any manuscripts until after the 18th century when a visiting Protestant minister noted that locals wore a small bunch of the plant's leaves on their hats on St Patrick's Day (17th March). 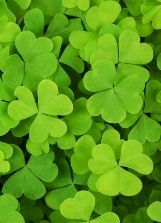 Whether or not the story of St Patrick using the shamrock plant in his teachings is true doesn't really matter because by the time it was reported as truth, the Irish had already chosen it as their symbol. It appears on medieval tombs and on old coins, and a written reference dating from 1681 describes it as a badge worn on the lapel on St Patrick's Day. By the 1770s it had certainly been adopted as the emblem of the Irish Volunteers, a militia with republican sympathies. This is where it came to be associated with rebellious, nationalistic views and led Queen Victoria's government to forbid all Irish regiments within the British Army to wear shamrock in the 19th century. These days, a member of the British Royal Family presents shamrock to the Irish Guards regiment, so it seems the dear shamrock plant has been rehabilitated! Which is the true Irish shamrock plant? It is said that the true plant can be grown only in Ireland or in Irish soil. This myth owes more to marketing wizardry than to any horticultural truth. 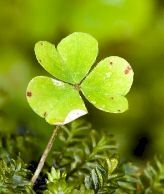 In fact, the three-leaf clover grows all over the world  from Tasmania to South Africa and from North America to England. It's just called by some other name in those places. Indeed it could be argued that the plant doesn't grow in Ireland at all. 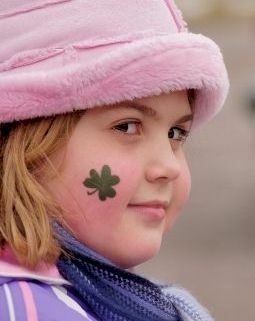 As Charles Nelson, one of Ireland's leading botanists, puts it, "Shamrock exists only on St Patrick's Day. Every other day of the year it's known simply as young clover." There is no single plant identified as shamrock, but there is, at least, agreement that it is a small leaved trefoil. In a survey carried out twenty years ago by Charles Nelson, then working for the National Botanic Gardens in Glasnevin, north Dublin, Irish people were asked to collect what they believed to be the true Irish shamrock plant and send them to him. Some 221 people from 30 counties responded. The majority (46%) were Triolium dubium, closely followed (35%) by Trifolium reopens. The remainder were split fairly evenly among the other three categories. All these plants possess a compound leaf with three more-or-less heart-shaped leaflets. All are found throughout the world. The name of the plant is the anglicised word for 'seamair' meaning clover and 'og' meaning young or small. It was first used in its English form in 1596 when the Irish herbalist John Gerard noted that 'meadow trefoils were called Shamrockes'.